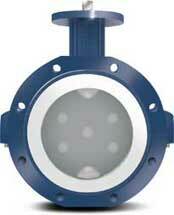 Plastic lined butterfly valves provide excellent flow control in both on/off and modulating options. PTFE coatings provide a smart non-stick coating that can withstand significant temperatures without adding any significant thickness to the internal pipe. For PTFE lined butterfly valves, the coating provides excellent chemical resistance against corrosive elements as well. SEMCOR supplies PTFE lined butterfly valves to customers in Missouri and throughout the Midwest, expanding our reach as a trusted distributor and fabricator of custom parts. To meet the plastic butterfly valve needs of our customers, SEMCOR works with suppliers such as Richter. Richter offers a wide array with different PTFE and TFM linings. Richter creates lug style and wafer style bodies with dimensions ranging from 2″ – 42″. A chief benefit of these plastic lined butterfly valves is the maintenance-free, self-adjusting stem seal design with options for safety stuffing boxes. This line is also designed to operate with corrosive, hazardous and pure liquids, gases and vapors in chemical processing as well as food processing, pharmacy and other industries. SEMCOR can supply the right plastic lined butterfly valve to meet your needs and adhere to the compliances important for your industry. KSB AMRI Butterfly Valves – Contact Us for product specific information. Ready to look through SEMCOR’s complete line of lined butterfly valves? After you’ve found what you need or if you have special circumstances, reach out to us directly to learn about the ordering process and customization options.